Sarge wanted me to try this Elvis Smoothie and report. If it's too hot and you're too tired to click on the link, I'll just tell you: it's a peanut butter banana smoothie, topped with bananas fried in bacon grease with the bacon as a swizzle stick. I know, right? I haven't gotten around to getting bacon, but I'm a little surprised at myself that I never considered just plain old peanut butter and banana for a smoothie. 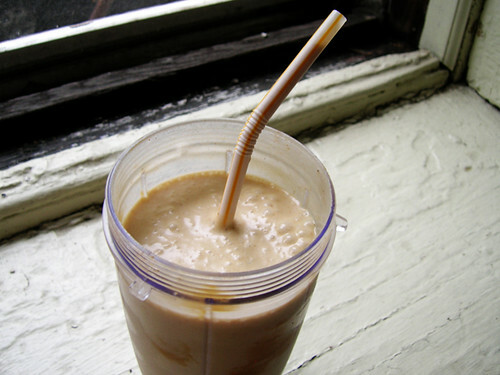 Put the frozen banana in the blender cup, then the peanut butter and flaxseed oil. Pour in a good amount of almond milk to almost fill the cup. Screw on the cap, stick the cup on the motor base, and blend for 30 seconds. Then take it off the base and give it a little shake to get anything that's stuck on the top of the cup. Blend for another 20 seconds or until the smoothie is churning freely from top to bottom.